Barnett Vineyards is located at 2,000 feet elevation on Spring Mountain in the Napa Valley, Fiona and Hal Barnett created a vineyard and winery specializing in Cabernet Sauvignon. They released their first wine in 1989. 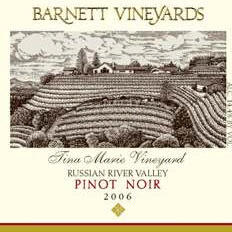 Late in 2008, the Barnetts finished a 3,600 foot cave allowing barrel aging to be moved to the estate from the valley floor. Limited amounts of Merlot, Chardonnay and Pinot Noir are offered. Total production is 6,000 cases. The current winemaker is David Tate who comes to Barnett from Ridge where he as an assistant winemaker. 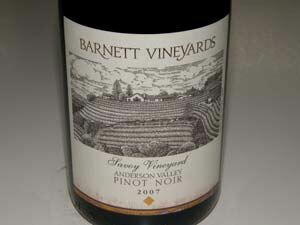 Pinot Noir grapes have been sourced from Savoy Vineyard and other vineyards in the Anderson Valley and the Tina Marie Vineyard in the Green Valley of the Russian River Valley. The wines are sold on the website with some retail distribution. The winery and vineyards are located at 4070 Spring Mountain Road, St. Helena. The phone is 707-963-7075.